UPDATED w/Image & Release!! Kirk/Spock STAR TREK To Get All-New HD Spaceships!! tvguide.com is reporting that TREK technolords/historians Michael and Denise Okuda are working on the project referenced below. They even have a picture of the Special Edition version of the Enterprise, seen here. You can CLICK HERE for a bit more information about the series restoration, which sounds like it'll be rolling out as early as this September!?!?!? Hollywood, Calif. -- STAR TREK is getting a 21st century makeover. CBS Paramount Domestic Television is releasing digitally remastered episodes of the iconic 1960s sci-fi series, with all new special effects and music, to celebrate the groundbreaking series' 40th anniversary, it was announced today by John Nogawski, president of CBS Paramount Domestic Television. The new episodes also mark the first time in 16 years that the original STAR TREK series can be seen in broadcast syndication. The episodes will begin airing on the more than 200 stations that own the rights to the weekend broadcast syndication window starting Sept. 16 (check local listings for station and dates). All 79 episodes of the original STAR TREK series will eventually be remastered, with the first batch of episodes chosen from a list of STAR TREK fans' favorite shows. "STAR TREK redefined science-fiction and constantly pushed the envelope with concepts that were ahead of their time," Nogawski said. "By giving the series a digital upgrade using the best technology available today, it will continue to be a leader in cutting-edge television programming as we introduce the series to a new generation of viewers." • Space ship exteriors -- The space ship Enterprise, as well as other Starships, will be replaced with state of the art CGI-created ships. The new computer-generated Enterprise is based on the exact measurements of the original model, which now rests in the Smithsonian Institution in Washington, D.C.
• Show opening -- The Enterprise and planets seen in the main title sequence will be redone, giving them depth and dimension for the first time. • Galaxy shots -- All the graphics of the galaxy, so frequently seen through the window on the Enterprise's bridge, will be redone. • Exteriors -- The battle scenes, planets and ships from other cultures (notably the Romulan Bird of Prey and Klingon Battle Cruisers) will be updated. • Background scenes -- Some of the iconic, yet flat, matte paintings used as backdrops for the strange, new worlds explored by the Enterprise crew will get a CGI face-lift, adding atmosphere and lighting. The refurbished episodes also feature higher quality sound for the famous opening theme. The original score by Emmy Award-winning composer Alexander Courage has been re-recorded in state-of-the-art digital stereo audio with an orchestra and a female singer belting out the famous vocals. A digitally remastered version of William Shatner's classic original recording of the 38-word "Space, the final frontier…" monologue continues to open each episode. 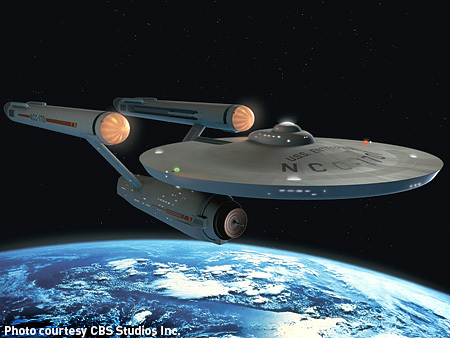 STAR TREK: THE ORIGINAL SERIES originally premiered on Sept. 8, 1966. Distributed by CBS Paramount Domestic Television, the series was created by Gene Roddenberry. The program stars William Shatner as Captain James T. Kirk, Leonard Nimoy as Mr. Spock, DeForest Kelley as Dr. "Bones" McCoy, James Doohan as Scotty, Walter Koenig as Chekov, Nichelle Nichols as Uhura and George Takei as Sulu. CBS Paramount Domestic Television is a unit of CBS Corp. The TREK world is abuzz over indications that The Powers That Be are considering revamping the original STAR TREK series (herein TOS) with reworked visual effects. This potentiality was reported the other day by The Digital Bits, specifically in this article. In doing some digging with our industry sources over the last few days... I've found out something that's going to come as a major surprise to a lot of you. It might be one of the best kept secrets in Hollywood in recent years. Never mind The Next Generation, Deep Space Nine and Voyager: It turns out that CBS Video, as part of their high-definition remastering of The Original Series, IS giving a lot of the special effects shots a new CG face-lift! Specifically, they're re-doing all of the spaceship shots. This to me is a very exciting idea... in principle. As anyone who saw the Mirror Universe episodes of Star Trek: Enterprise will tell you, the old TOS ships look awfully damn good in new CG. The replicated TOS sets, the original ship designs... rather than looking dated, they actually hold up VERY well by today's standards. Re-doing the effects will give new life to The Original Series and could help it appeal to a new, younger generation of fans. Unlike, say... the Star Wars films... the original versions of these episodes will always be preserved in GREAT remastered quality on DVD. And it would be extremely cool if CBS would release BOTH versions of the episodes on HD-DVD/Blu-ray, such that you can choose which version you wish to watch... the original or the new enhanced version. As far as being “the best kept secret in Hollywood”, this is only partially correct. Rumors of TREK “Special Editions” have persisted for ages; one was reported here on AICN (I can’t find a link via our ornery damn search engine) years and years ago. However, The Bits article is correct in that this is the first substantive indication that such an undertaking is moving forward. In fact, HERE IS A LINK to a website about the Special Editionalizing we specifically discussed back in the day. There’s footage here…check it out. This was a proposal worked up by Daren Dochterman – the piece was submitted for Paramount’s consideration. It didn’t "go". And…when all is said and done…we may wish it had. While Dochterman’s DOOMSDAY MACHINE was a dry run and likely did not reflect the full potential of episodic retooling, it should be pointed out that Dochterman also worked on the STAR TREK: THE MOTION PICTURE restoration…a prime example of how to do something like this right. Film grain was sampled from the original film stock, then laid over the newer material to make its integration more organic and seamless. New FX were rendered while factoring in the restraints & limitations present when the film was initially produced (i.e. no wild camera movements were incorporated that felt out of place with the original dynamic of the material). Unused storyboards were perused to gauge the intent of FX artists who didn’t have the time or resources to complete what they set out to do. Smart and noble. I’m pointing all of this out as examples of the care that is required to make something like this work…the same care that may not be afforded to the TREK TOS Special Editions. Herc and I spent the last few days dispatching a fury of e-mails in an effort to confirm this story. We HAVE now confirmed the overall accuracy of The Digital Bit’s report. The TREK TOS will be put through a makeover. New FX for all of the space material. A new title sequence. The effects will be brought to us by the same team who handled CATEGORY 7: THE END OF THE WORLD – an in-house FX group at CBS. One source characterized the overall nature of this undertaking as “incredibly cheap”. Elements of The Original Series’ score will be reworked or replaced as well. For my money, the original TREK score was among the finest TV scores of all time – sweeping and propulsive. A bit repetitive perhaps, due to a process called “tracking” in which the same cues could be reused time and time again (i.e. generic “action” music, generic “romance” music, etc.) This practice was ultimately banished. All of this would be a little more digestible if the original directors, photographers, and FX technicians were involved – if these reworked episodes were being handled in a manner that reflected the intent…or addressed the frustrations…of the people who originally made the shows to begin with. This isn’t likely, given the passage of so much time. Hopefully, a press release on the matter…rumored to arrive as early as tomorrow…may shed more light on how all of this will shake out. Which begs the question: why is this being done? To make more money? Because Paramount feels strongly that such an undertaking will help make TREK more marketable to a new generation of fans? Because “we” know better than they did back then? A genuine effort to reinvigorate a franchise that was roundly beaten down by Rick Berman and Brannon Braga? Or, mere hubris? Ultimately, the end result here will only be as good as the talent involved, and the technology they have at their disposal. Personally, I’m thinking there’s a high possibility this could be a gargantuan train wreck if The Powers That Be decide to take the easy path, instead of attacking their mission with the love, respect, and…above all…finances required to make something like this work. The STAR TREK: THE MOTION PICTURE Special Edition was an excellent example of how to pull off such revisitation. DEEP SPACE NINE’s “Trials and Tribbleations” was another fine endeavor. But they were time consuming, enormously costly undertakings. Seems unlikely that Paramount will shell out the expenses to do this right. This being said, I'd love to be wrong. At the end of the day, as long as Paramount continues to make the original iteration TOS available in both standard and HD formats, this could, at he very least, be an interesting novelty piece. And, while the notion of tainting TREK: TOS may chafe some die hards, at least we have it better than STAR WARS fans -- who spent years screaming and shouting to convince George Lucas that “the original versions” of the first trilogy actually existed...and mattered. If anyone out there has more details about this, E-MAIL ME!!!. Or, E-MAIL HERC!!!. We’d love to hear from you! On a personal note, I'd like to thank Herc for letting me play in his sandbox & share in this particular adventure. TREK is very important to me & I love reporting on it. He's been most gracious, and extremely supportive. My understanding is that as a lot of the ship/effects shots in TOS were done optically, they're rife with dust, dirt and the like. As CBS readies the episodes for eventual HD use, they're basically re-doing the ship shots in CG, but they're apparently taking GREAT pains to ensure that the new shots match as closely as possible to the look and texture of the originals. The result should be close to identical, save for MUCH higher in quality/clarity and thus ready for HD broadcast and release. And that's precisely why I've so long been craving the old episodes in HD. I'm like V'ger reaching out to become one with The Kirk. I want to feel like I'm on those revered particle-board sets. I want to see that model-kit Enterprise in the space-station window. I want to see the seams on Spock's ears and the coffee stains on his tunic. And I certainly echo Merrick's sentiments -- I'm cool with the new CGI effects work, and I'm keen to see what they look like, but if the un-upgraded "Where No Man Has Gone Before" and "The Cage" aren't made available in HD as well, I think a lot of us Trekkies are going to be plenty mad!